Several people have reported buying presentation packs containing only 4 stamps. This is what definitive presentation pack No 90 looks like. All around the country packs are being sold from Post Offices without the low value stamps issued on 8 March. This is a mistake in make-up by Royal Mail or their suppliers. Note that the stamps in the pack have been guillotined (possibly from coils) not torn from sheets. The backing paper is thus much smaller than on the sheet stamps. 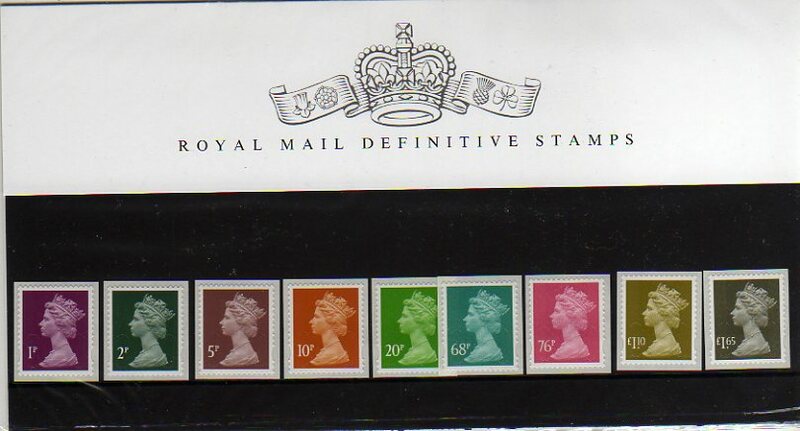 If your pack is missing the 1p - 20p stamps you want the guillotined ones to put in it, not stamps torn from sheets. Hi, on the RM website the pack is listed as £4.19 and looks like it contains 4 stamps, though this could be 4 mint stamps, but the large picture shows a presentation pack??? It seems that the pack shown in the image is what people have been sold at Norwich, Nottingham and elsewhere. Hi ,i purchased 2 packs from Birmingham main post office which just had the 4 stamps, when i went back they gave me a stockcard with the 4 low values (guillotined) and said they were aware of the problem. I hope that was a slip of the digit - there should be 5 low values! Good that the back-up system seems to be working. Is it posible that the PP stamps have been guilotined from exising sheets of 25? It's possible. But the size of the guillotined stamps is smaller than the torn ones by an amount greater than would occur with a straightforward single-knife guillotine, in my opinion. If the stamps were cut from an original sheet then it would have required a double-bladed knife, and in both directions; or a die-cutter to cut out a mesh-shape with the paper cut-out at least 1mm wide. I thinking cutting from a continuous (coil) strip would be more likely. Producing strips for packs and FDCs is not unknown. The High Value Machins were printed in a side-fed four-value coil for the High Values Coin cover issued 1 December 2009, and the Union Flag definitive-size greetings stamp was produced in a single-design coil for the Act of Union cover a few years ago.